Winds of over 2km per second have been discovered flowing around planet outside of the Earth’s solar system, new research has found. 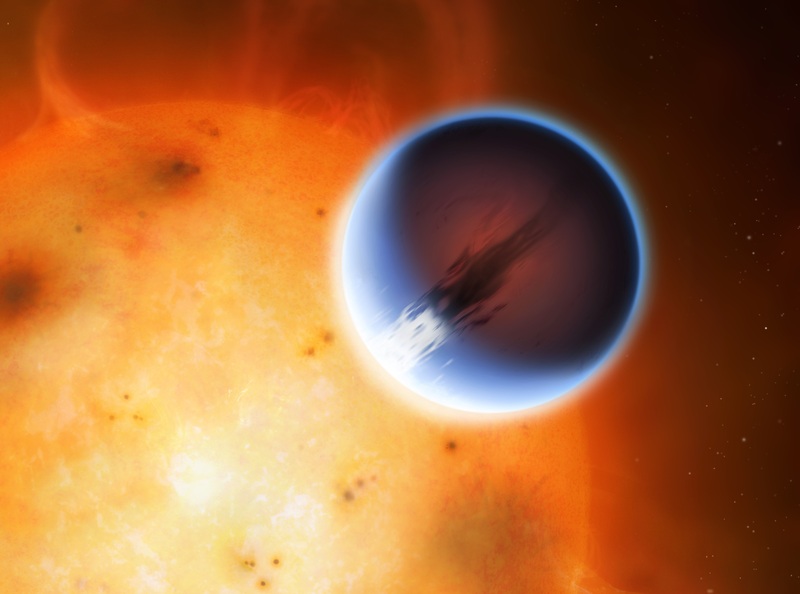 The University of Warwick discovery is the first time that a weather system on a planet outside of Earth’s solar system has been directly measured and mapped. “HD 189733b’s velocity was measured using high resolution spectroscopy of the Sodium absorption featured in its atmosphere. As parts of HD 189733b’s atmosphere move towards or away from the Earth the Doppler effect changes the wavelength of this feature, which allows the velocity to be measured”. HD 189733b is one of the most studied of a class of planets known as 'Hot Jupiters'. At over 10% larger than Jupiter, but 180x closer to its star, HD 189733b has a temperature of 1200'C. Its size and relatively closeness to our solar system make it a popular target for astronomers. Past research has shown that the day side of the planet would appear a bright shade of blue to the human eye, probably due to clouds of silicate particles high in its atmosphere. The research, Spatially resolved eastward winds and rotation of HD 189733b, is published by Astrophysical Journal Letters. HD189733: The planet HD 189733b is shown here in front of its parent star. A belt of wind around the equator of the planet travels at 5400mph from the heated day side to the night side. The day side of the planet appears blue due to scattering of light from silicate haze in the atmosphere. The night side of the planet glows a deep red due to its high temperature. Tom Louden is supported by a STFC studentship and Dr Wheatley by a STFC consolidated grant.